As I wrote a week and a half ago, Hollywood Land brings a unique brand of Christmas, injecting it with a glitzier, shinier sort of holiday energy. The decorations reflect the classic, 1930s Hollywood Golden Age sort of aesthetic, heavy in gleaming garland and reflective ribbons. It's not exactly my personal favorite sort of Christmas look, but it does look very much at home in this environment, blending into the nostaltic Buena Vista Street Christmas look as wel. At DCA, Buena Vista Street and Cars Land get all the attention for their strong Christmas decorations, and deservedly so. They do an amazing job, and their holiday furnishings provide such an immersive ambiance. 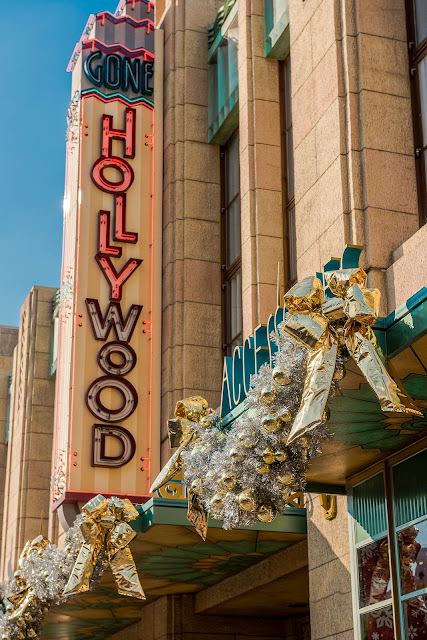 But Hollywood Land is no slouch in the decorations department either, and it brings a fun and different take on the holiday looks!